The Journal of Sol-Gel Science and Technology (JSST) is the official journal of the International Sol-Gel Society and a key reference for anyone interested in sol-gel science and technology. JSST explores materials processed by chemical nanotechnologies known as the sol-gel process and presents original research and technological manuscripts in the form of extended report. The primary objective of the JSST is to provide an international forum for the dissemination of scientific technological, and general knowledge about materials processed by chemical nanotechnologies known as the “sol-gel” process. The materials of interest include gels, gel-derived glasses, ceramics in form of nano- and micro-powders, bulk, fibres, thin films and coatings as well as more recent materials such as hybrid organic-inorganic materials and composites. ISGS members have free on-line access to all the papers published in the JSST. Log in first in the Members Area and the link will appear below. The journal remains a major forum for reporting results of the studies in the domain of sol-gel science and its applications. In 2015, over 900 submissions are expected. The acceptance rate remains moderate, staying at 42 % in average through the last 4 years. The geographical origin of the submissions is broad, being dominated in the last period by China (32%), India (15%) and Iran (8%), followed by Korea, Malaysia and Turkey (4% each), and then by Japan, Taiwan and the countries of Europe and South America (1-3 % each). Journal of Sol-Gel Science and Technology is currently covered by the following (A&I) services: Science Citation Index, Science Citation Index Expanded (SciSearch), Journal Citation Reports/Science Edition, SCOPUS, INSPEC, Chemical Abstracts Service (CAS), Google Scholar, EBSCO, CSA, ProQuest, Academic OneFile, CEABA-VtB, ChemWeb, Chimica, Current Abstracts, Current Contents/Engineering, Computing and Technology, Earthquake Engineering Abstracts, Ei Page One, EI-Compendex, Engineered Materials Abstracts, Gale, Glassfile Database, INIS Atomindex, Materials Science Citation Index, OCLC, PASCAL, Polymer Library, SCImago, Summon by Serial Solutions, VINITI – Russian Academy of Science. Ranking and quartile: JSST is ranked in the second quartile (Q2) for the category Materials science, ceramics (ranking 7th out of 26 journals). 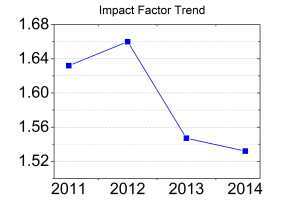 The 3-year impact factor of 1.532 in 2014 (a decrease from maximum of 1.66 in 2012). The 5-year impact factor is 1.793 and sets the journal as number 5 in its category. Satisfaction: 96% of authors (156 respondents) are very satisfied (1 and 2 on a scale of 5) witht the overall publication process in JSST. JSST accepts graphical abstracts since August 2014. Volume 65 – Issue 1, January 2013, is a special issue dedicated to Sol-Gel 2011 Conference. If you are not ISGS member, you can have a look in the table of contents on Springer link here. Volume 57 Number 3 is a special issue dedicated to Sol-Gel 2009 Conference – you can have a look in the table of contents here. Sign up for Table of Content alerts: you will receive the table of contents of a new JSST issue when the issue is available online on SpringerLink. Select Journal of Sol-Gel Science and Technology in the section Chemistry / Inorganic Chemistry or in the section Materials Sciences / Ceramics, Glass, Composites, Natural Materials and create your account in this page.